Sister Lisa Ann Lettiere, I.H.M. Sister Lisa Ann Lettiere, I.H.M., received an honor July 12 as the Blindness and Low Vision Studies Alumna of the Year 2018 from the Alumni Association of Salus University. Sister Lisa Ann is principal of St. Lucy Day School, the Archdiocese of Philadelphia-run school of special education for blind children. Kara Haggerty, principal of Holy Family Regional Catholic School, Aston, presented the award to Sister Lisa Ann. 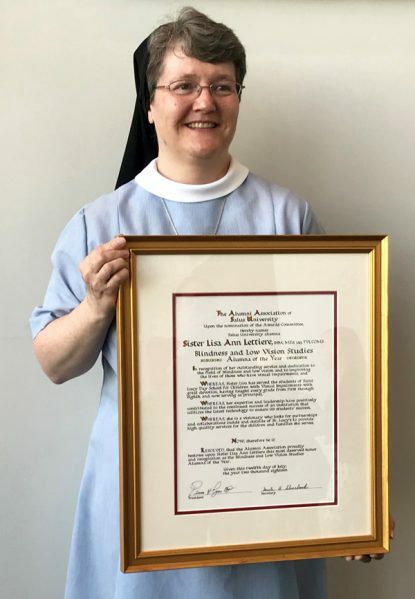 Hearty congratulations to Sister Lisa Ann Lettiere.